The soft flowing curves of the Ravello Sling High Back Swivel Rocker aluminum frame offer a casual elegance, while the broad extrusions of the arms and legs add comfort and strength. The fully cast arms are gracefully accented with two opposing scrolls tied together with a band and embellished with the leaves of a laurel wreath. The ergonomically designed high back of the dining chair adds another level of comfort to any outdoor dining experience. 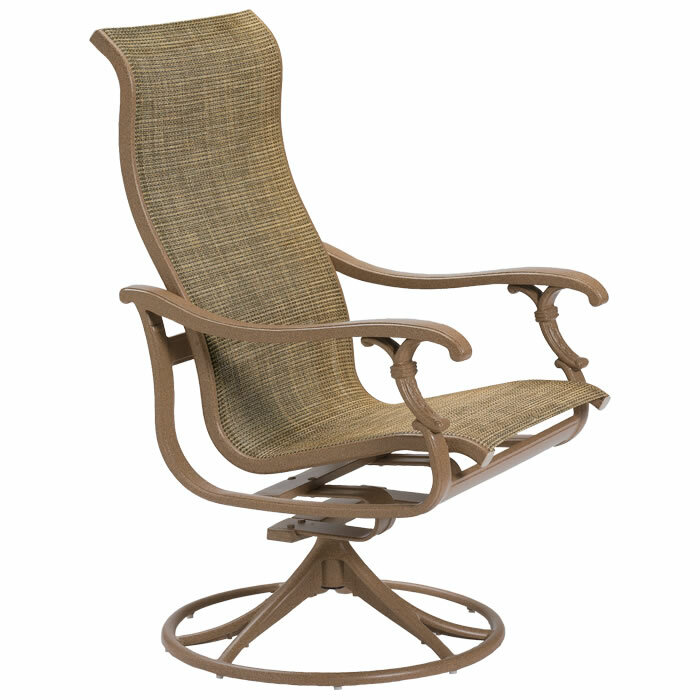 This outdoor swivel rocker, designed by Robert Mainville, features vinyl-coated polyester fabric for extra comfort and durability. The result is a classic patio chair that will have guests rocking in relaxation and brings old world charm to the dining table. Find a Tropitone dealer near you.